Mobile security firm Appthority has published an interesting report that revealed some Android and iOS applications which are most frequently blacklisted by enterprises. According to the report, iOS apps are mainly blacklisted because many of them leak valuable user data. Whatsapp is the most commonly blacklisted iOS app because it sends information from the device’s address book to a remote server. 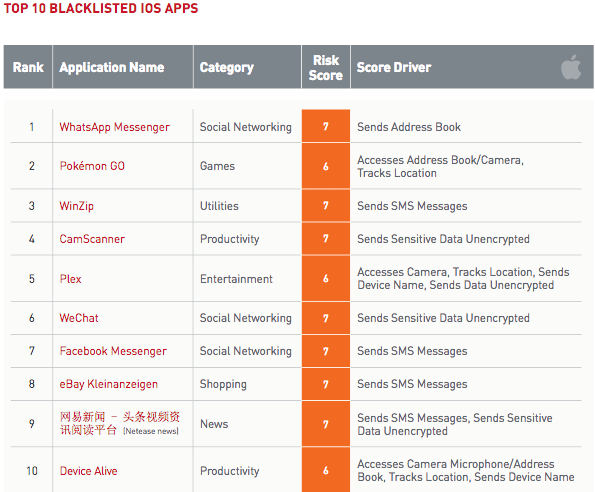 Looking closely at the list of commonly blacklisted iOS apps, we notice the presence of Pokemon GO, the risks for this app are related to the accesses to customer address book and camera, and tracking of the user’s location that poses users’ privacy at risk. Another app that is commonly blacklisted is WinZip, the reason is that this application sends SMS messages. This type of behavior in applications can pose a serious risk in an enterprise environment, especially if the data is transmitted without being encrypted. The most blacklisted enterprise app for Android is Poot, a tool used by its users to root and unlock their android devices. Other commonly blacklisted applications are AndroidSystemTheme, Where’s My Droid Pro, Weather etc. 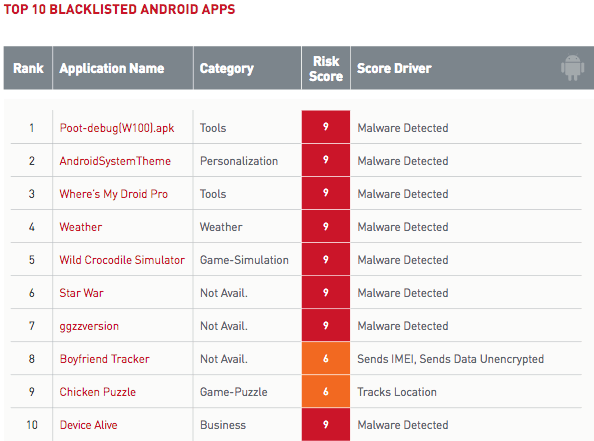 Android apps have been mainly blacklisted also for data leakage or malicious behavior. According to the this report based on the analysis of 150 apps used in enterprise environments, for 86.7% of Android apps the connections were made to servers located in the United States, Ireland (7.7%), Germany (2.1%) and Sweden (0.7%). For iOS apps, nearly 94% of connections were to servers in the United States, then Ireland (3.82%), the Netherlands (0.86%) and Germany (0.86%). Enterprise security is often concerned about the countries to which mobile data is being sent.Android developers are connecting to a wider set of geographic locations, possibly leveraging lower cost structures overseas. Popular apps have a much lower percentage of connections to countries such as China, Saudi Arabia and Chile than Android apps. Management of the mobile devices in the is a crucial aspect of Cyber Security in enterprise environments.